Korea poured a lot of money into the production of this sprawling 2009 melodrama, Cain And Abel, inspired by the Biblical Genesis story of the first murder to take place on earth, with one brother killing another brother due to jealousy; Cain thought God the Father loved Abel more than He loved him. 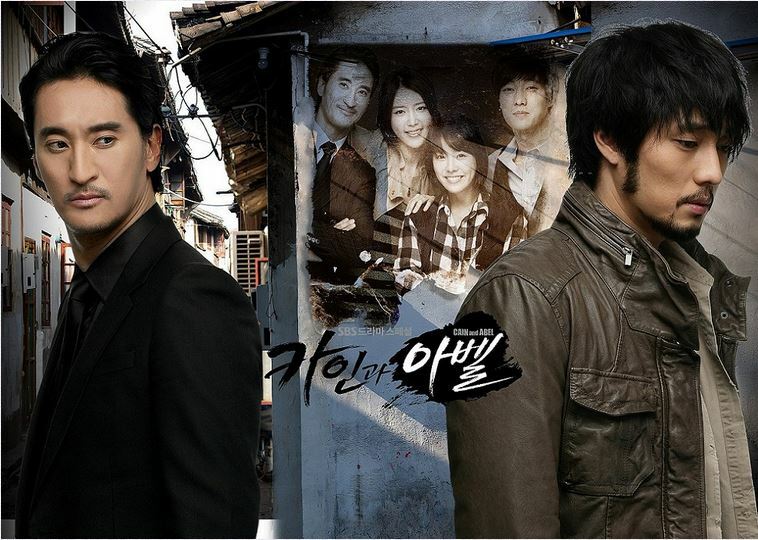 In this drama the same thing occurs - one brother is jealous that his father seems to love the other brother more. My favorite Korean actor So Jisub (top right) won multiple awards for his leading actor role in this drama; Top Excellence Award for Best Actor in the SBS Awards, Best Actor in the Grimme Awards, and Actor Of The Year in Broadcasting by the Ministry Of Culture. (I would love to take a peek into So Jisub's living room sometime and see the huge lineup of all the awards he's won since starting in show business almost twenty years ago!). This was the second So Jisub Korean drama I watched; the first was his hit 2004 melodrama I'm Sorry, I Love You, which made many people around the world fall in love with him for the first time. After seeing him in that wonderful show, I wanted MORE, so I purchased an early DVD set for this show. Like the incredible opening scenes on location in Lapland in the K-drama The Snow Queen, the opening scenes in Cain And Abel filmed on location in a desert in China bowled me over too - they reminded me of certain scenes in the classic film Lawrence Of Arabia. With sandy vistas all around him, So Jisub's character looks to be dying, he's been shot in the head and is all bloody, he fears he is losing his memory, and he collapses and stares at the sky, looking like he is about to give up the ghost. "Wow!" I exclaimed, "I think I am in for another great So Jisub experience!" And to be sure, he was the absolute BEST thing about this series, his performance was always spot on in every scene; and the next best thing about this show was the actor who played his brother, Hyun-joon Shin, who had been so excellent in the classic 2005 K-drama, Stairway To Heaven. I saw more chemistry and intensity between the two men on screen (typically called a "bromance") than I did with them and the two actresses who played the love interests, Ji Min Ha (who was so good in 2011's Padam, Padam) and Jung-an Chae (2nd female lead in When A Man Loves). Both ladies were perhaps just too beautiful yet oddly generic at the same time, so much so that they seemed unreal. Watching them made me miss the incredible on-screen chemistry So Jisub had had with the great actress Su Jeong Im in I'm Sorry, I Love You. She is beautiful in her own way but is not a classic beauty like the two women in this show, yet she has more fire and intensity in her soul as an actress than the two of these ladies put together! I really feel this show would have been better if it had been written as a pure, straight melodrama with the focus on the two brothers alone, without any women love interests at all. That would have made it so unique and compelling! After all, the real Cain and Abel weren't fighting over a woman in any way, shape, or form, when Cain killed Abel! After the dramatic opening desert scenes, we flashback to an earlier time. Cho-in Lee (So Jisub) is a gifted and spirited young doctor who has worked very hard all his life, partly to impress his loving father Jong-min Lee (Yong Jang), but mostly to try and follow in the footsteps of the older brother whom he admires, Seon-woo Lee (Hyun-joon Shin), who is a John Hopkins' trained neurosurgeon. Growing up the two boys had always been competitive, and shared an admiration for a mutual female friend who is a well-known musician and singer, Seo Yeon Kim (Jung-an Chae). Seo Yeon had initially fallen in love with Seon-woo but was angered when he went to the US for several years for medical training and deserted her. After Seon-woo returns from America, it's Cho-in who proposes to Seo Yeon first, bringing an engagement ring to her after one of her concerts, beating his older brother who was following up in the rear to try and hook up with her again romantically. A bitterness begins to foam up in the rather parched soul of the older brother against the younger brother. Although they had greeted each other warmly with a big hug (on the rooftop of the hospital!) when Seon-woo had come home, the relationship between them begins to disintegrate almost immediately, as they begin to compete for Seo Yeon's affection as well as for their share of the glory of their medical work as doctors in the same hospital. In the latter area, it's Seon-woo who gets the most glory at first, especially from their mother, who is the administrator of the hospital, Hye-joo Na (Hae-sook Kim, veteran of dozens of films and dramas). For many years she had favored Seon-woo over Cho-in because Cho-in was adopted and not her biological son. (It comes out later Cho-in is the biological son of the father, born from an affair with another woman). The mother naturally resented having to raise him, hence the conflict. The audience can easily see that the Cho-in character is the Abel character, full of altruism (he often pays for poor patients with his own money), and the Seon-woo character is the Cain character, more uptight, questioning who really loves him and who does not. The brothers' father lies in a hospital bed pretty much comatose; he had been the hospital director before his illness and now the cantankerous mother has taken over the position. When the hospital is deciding whether or not to fund the neurosurgery department over an emergency clinic the board members have to decide which to focus their funding on -- Cho-in represents the emergency clinic because it would help more poor people, and Seon-woo of course represents the neurosurgery department for people with enough money or insurance coverage to pay for delicate surgeries. (Already we can see where "the love of money is the root of all evil" - 2 Timothy 6:10). Before a crucial board meeting is supposed to take place, the mother claims there is an important surgery that Cho-in should go watch in China because it will help him to eventually operate on his father, to get him well again. The way too trusting Cho-in agrees - anything for Dad! Once he lands in China, Choi-in meets a young lady named Young-ji Oh (Ji-min Han) who is supposed to be his tour guide while he is there. She is a scrappy young lady who lives on the edge, born in North Korea, but who had escaped to China with the hopes of getting to South Korea eventually. While in China she is trying to get some family members out of North Korea and so she has to raise a lot of money fast for that purpose. She is confronted before meeting Cho-in by some thugs hired by the nasty mother character back in South Korea, who tell her she will receive lots of money if she can keep Cho-in sidetracked in China while he is there. So Young-ji initially is going to have to be the mother's spy, keeping tabs on Cho-in and trying to keep him in China as long as possible; Young-ji is falsely told that Cho-in is a bad doctor, unworthy of respect, so she is more than a little surprised to see that the image she's been told about doesn't quite fit this gentlemanly, kind young man who arrives in the airport. Nevertheless she ends up convincing the too trusting and nice Cho-in to hand over his South Korean passport for "safekeeping". Young-ji never lets Cho-in out of her sight, which leads to some mildly amusing situations -- she is afraid if she loses him she won't get paid. Meanwhile, with Cho-in over in China, the funding about to be voted on by the hospital board members, for either the emergency clinic or the neurosurgery department enhancement, doesn't quite go the way the nasty mother character anticipates - it turns out there is more support for the clinic than she originally thought, even without Cho-in there. The mother begins to panic. An order is given out to get rid of Cho-in ... permanently. She wants all the glory to go to the only son she really loves, Seon-woo. Meanwhile, without Cho-in around, Seon-woo is able to make a new play for his old love interest Seo Yeon, who had accepted Cho-in's engagement ring and is waiting for him to return from China. Seo Yeon struggles with her old lingering feelings for Seon-woo. Eventually she is diagnosed with a heart condition (those dang heart conditions, they keep showing up in K-dramas along with leukemia!) and guess who the doctor will be who operates on her and saves her life? Back in China, Young-ji gets appendicitis and begs Cho-in to operate on her outside of a big medical complex (she is afraid of being tagged by the authorities as an illegal alien and sent back to North Korea if she goes to a hospital). When he operates and heals her, Young-ji finally realizes that Cho-in is a good person. She returns his passport to him but she isn't successful to save Cho-in in time from the thugs working for the mother and her loathsome assistant who is in cahoots with her back in South Korea. 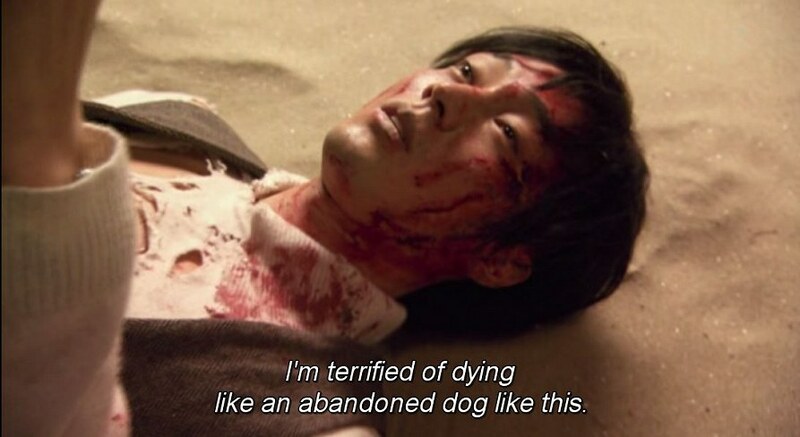 Cho-in is kidnapped by them, shot in the head, and dumped in the desert to die, at the same time Seon-woo is operating on their comatose father. Back home, the nasty mother had seemed to have a last minute change of heart, feeling the dastardly plot is all going to backfire on her, and she wanted the order to kill Cho-in cancelled, but it's too late -- Cho-in is dying, just like she had privately hoped for in the beginning, and now that Young-ji has no way to keep an eye on Cho-in anymore her life is in danger too. Cho-in watches in horror as the thugs who kidnapped him dig his own grave! What are the chances our doctor Cho-in would be rescued in the middle of the desert? Practically none, right? Yet that is exactly what happens. I will leave it to you to watch these incredible scenes and see how the New And Smarter Dr. Cho-in rises to the occasion because of all the tragic situations he has to go through. Afterward he has amnesia for a time (thankfully not too long! ), but his new persona is no longer the same, he is not naive, he doesn't trust people, he is angry as hell, and he determines to find out who orchestrated the plot against his life. This part of the drama is where So Jisub's acting really shines and comes into its own -- the expressions in his eyes are much more intense, his body language changes completely, even his voice gets thicker and more resolute. It's amazing to watch his transformation of this character. I can tell he learned a lot as an actor while making this drama. While I did kind of miss his former kindly personality a bit afterward it had definitely been more bland, but from episode 4 on everything changes. Will he discover who planned to kill him? Will he track down Young-ji and help her, or will he feel vindictive toward her? His brother also does not act in his best interest, and becomes more and more jealous of him when he finally returns home to South Korea. For some unknown reason, the moment that Cho-in was shot Seon-woo had started to lose his surgical brilliance. It's almost as if God is taking His own revenge on "Cain". Then Seon-woo gets sick - will Cho-in operate on his own brother to save him? Will the scheming mother ever get her just comeuppance? To sum up, I think you should enjoy the first few episodes of this drama like you would a nice merry-go-round ride, but the middle part of this drama as you would a giant roller coaster ride. The ending is unpredictable as well. You won't quite get the full Old Testament interpretation, but one more in line with New Testament teachings of forgiveness and redemption. To give you a clue -- I really didn't shed a single tear watching this drama until the very last episode, in particular the last few scenes. They were quite beautiful. This show is definitely an old fashioned good vs. evil story, but I still stand by my statement that Cain And Abel would have been much more intense and interesting overall if there had been no love interests, but had remained a brother against brother story alone. Now that would be a novel way to approach a K-drama - no romance, just action and tight melodrama, with the "Love Story" being between two men who loved one another in childhood but who were pitted against one another as adults and began to hate one another. You can buy a DVD set for Cain And Abel on Amazon. Enjoy.